Music Together at Alley Bell Music - Welcome to Alley Bell Music! Every week in our Music Together® classes at Alley Bell Music, babies, toddlers, preschoolers, and the grownups who love them come together to play together musically. Little ones love playing along in class, and caregivers love being a part of their children’s growth into confident music-makers. And everyone loves our songs that’ll have you tapping along in no time. Music Together® is the perfect family activity in Edmonds, Lynnwood, Lake Forest Park or Lake City! Music Together classes are offered multiple days a week at our Edmonds, Lynnwood, Lake Forest Park and Lake City locations. Check out our schedule to find the best class time for your family. Please follow us on Facebook, Twitter and Instagram! K-2 Music Fundamentals class for homeschooling children: in this weekly 45 minute drop-off class, children have the opportunity to develop rhythmic and tonal skills through songs, chants, creative movement, musical games, and instrument exploration. This class also introduces the children to music history and beginning music theory concepts. This class is in alignment with the WA State Essential Academic Learning Requirements for Music, and is taught by a teacher with a degree in K-12 Music Education. Our instructor is an approved Community Based Teacher with the Quilcene School District P.E.A.R.L. program. Students enrolled in the P.E.A.R.L. program may arrange to pay their semester tuition via a purchase order through the Quilcene School District. Private Voice Lessons: Lessons are available for students ages 10 to adult. Emphasis is on classical, folk and musical theater styles. Learn how to use your voice in a way that is healthy and sustainable through the study of proper posture, breathing, vowel formation, musical style, and theatricality. Prepare for auditions or collegiate studies, or study just for the pure enjoyment of SINGING! Lessons by appointment only. 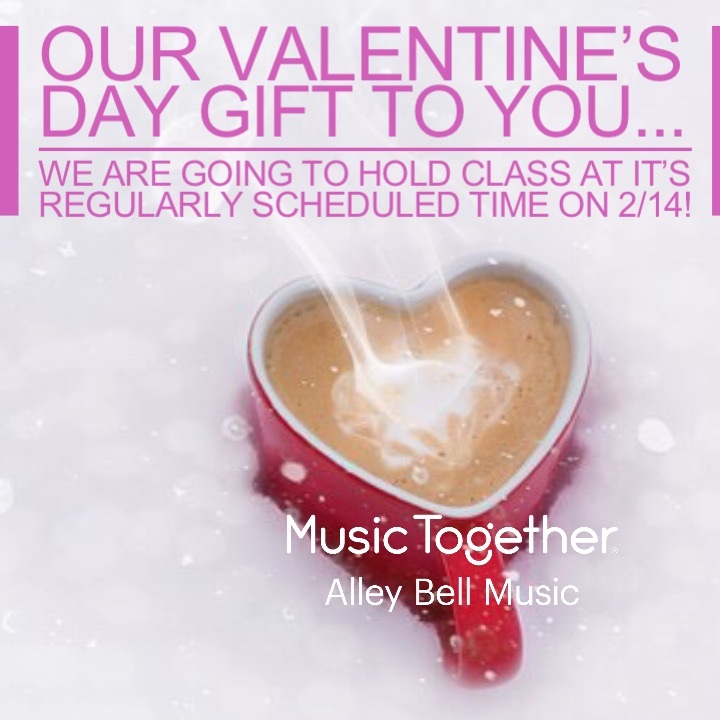 Please email alleybellmusic@gmail.com to discuss available lesson times. Music Together con Español Demo! Have you been curious about our newest offering, Music Together con Español? 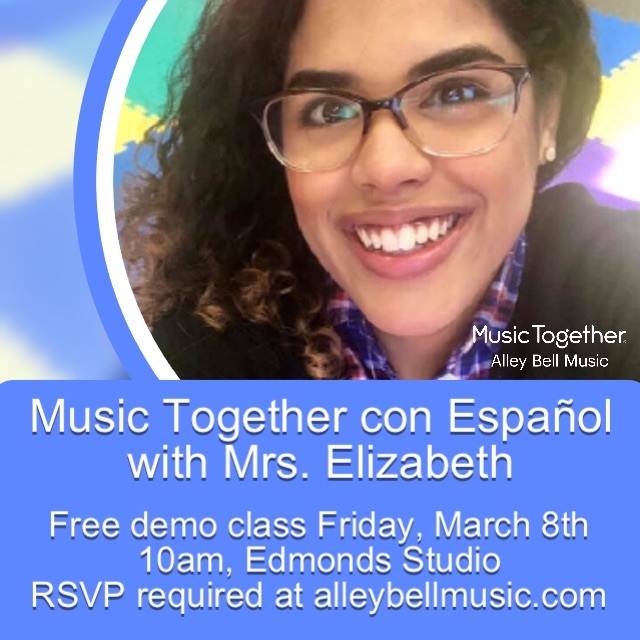 Come and experience Music Together with the added twist of Spanish language immersion in our special demonstration class with Mrs. Elizabeth! No previous Spanish language experience required. Space is limited, please reserve your spot by clicking on the demo scheduler! Pre-Registration has begun for our Spring 2019 classes! If you are a continuing family, please check your email inbox for your special pre-registration code! 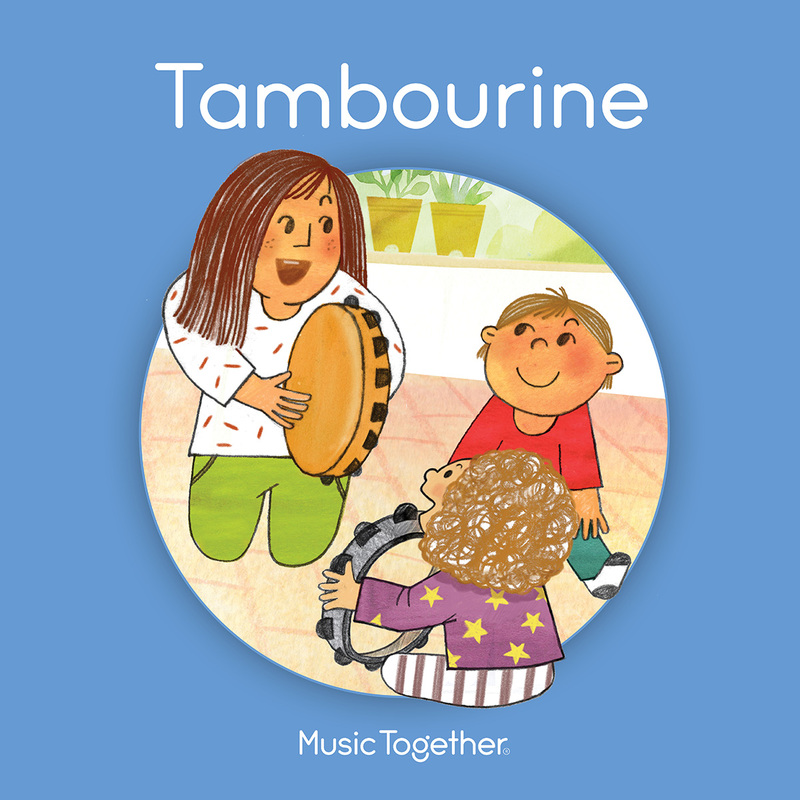 This spring’s Tambourine Collection features 25 fabulous songs and chants, including three songs that are brand new to the Music Together curriculum! Open registration will begin February 21st for new families! 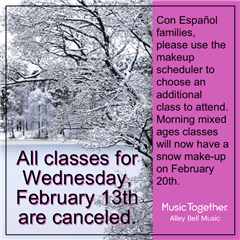 Classes will run ON TIME for Thursday, February 14th! Mother Nature has defeated us yet again! But, we can still make Music Together! We invite you to tune in for a special Snow Day Singalong on 2/13 at 3pm on the Alley Bell Music Facebook page! Copyright © 2012 Alley Bell Music. All rights reserved.